Earlier today, we learned that users of iOS devices are secretly being tracked by their the own iPhones and iPads. Their location data is being stored in an unencrypted file, potentially accessible by anyone possessing some basic technical knowledge and a sinister motive. When an iPhone or iPad is connected to a computer, that data file is transferred to the computer along with other, more innocuous information. As of yet, there’s no way to prevent your iPhone or iPad from storing the location data, short of deleting all of your backed-up information (i.e. contacts, settings and text messages), a real pain if you ever happen to lose your phone. Speaking of losing your phone, consider that if it does wind up in someone else’s hands, they’ll have easy access to a tidy record of all the places you’ve been, potentially stretching back nearly a year. Connect your iPad or iPhone to the computer you normally use to synch your device. Select the device in iTunes to bring up the summary screen. Then, set the password that will be used to access your device’s backups. 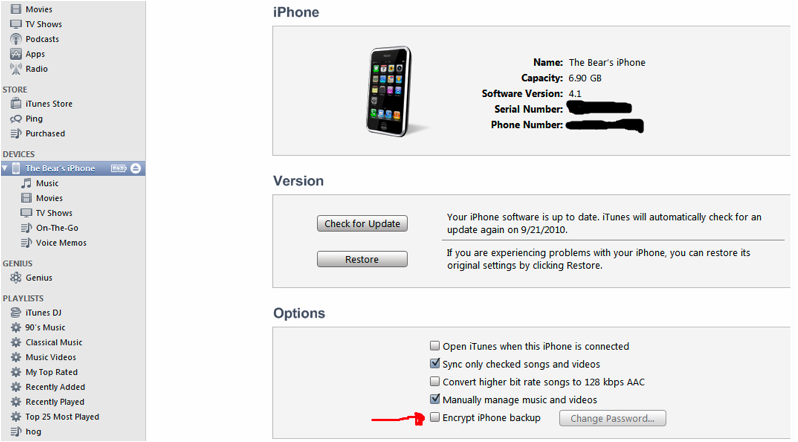 Note that this procedure only encrypts backups. The original files, as we understand it, remain unencrypted while on the device itself.